This module helps the student develop an understanding of the contribution of snowmelt in the hydrologic forecasting process. The module first explains the influences of wind, sun, terrain, and vegetation on snow water distribution and then discusses the evolution of snowpack characteristics. From there, the student will learn about energy exchanges between the snow and the atmosphere and how that affects how quickly and how completely snow will melt. Finally, an explanation is presented of water flow through snow and the fate of that water when it reaches the ground surface. The lesson will be highlighted with brief examples of actual snowmelt cases. This was an easy to follow fun informative module. It was fun too as I live in a snow prone area and already knew many of the subjects that it touched on. This was a good module but I found it rather hard to follow. I spent more time on this one than on the Hydro Intro. Describe the development and evolution of snowpack: - Explain the influences of terrain, wind, vegetation, and temperature. - Describe how sublimation affects snowpack. - Describe the process of snow metamorphism. - Explain SLR and SWE. - Describe why and how snow energy exchanges are important. Describe the processes leading up to and during melting: - Explain the importance of latent heat exchange. - Describe what is necessary for rapid melting. - Explain the importance of rainfall on the snowmelt process. 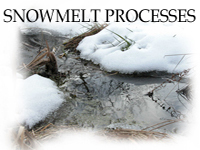 Describe the fate of melt water from snow: - Describe how water can move through the snowpack. - Explain what happens when melt water reaches the ground surface. - Discuss a situation that would result in rapid runoff from snowmelt.